Here's a long overdue follow-up on a post from a few years ago. I started off with an early 70s poplar Fender Musicmaster Bass body that had been mercilessly routed for different pickups and then apparently broken in half and badly reglued together. The body was a cheap ebay purchase - I think I paid $15 for it plus shipping. The initial stages of rebuilding and refinishing the body are covered in this post. 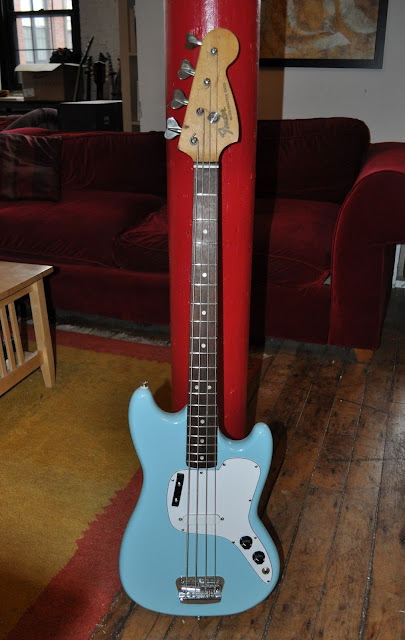 I eventually tracked down a 1971 Musicmaster neck that had been defretted and a set of the fairly unique early Musicmaster Bass tuners. As is often the case - the large body plugs I had glued in when I repaired the body were showing their seam marks, so I ended up sanding the front and back faces of the body flat again and spraying a few more coats of Daphne Blue. 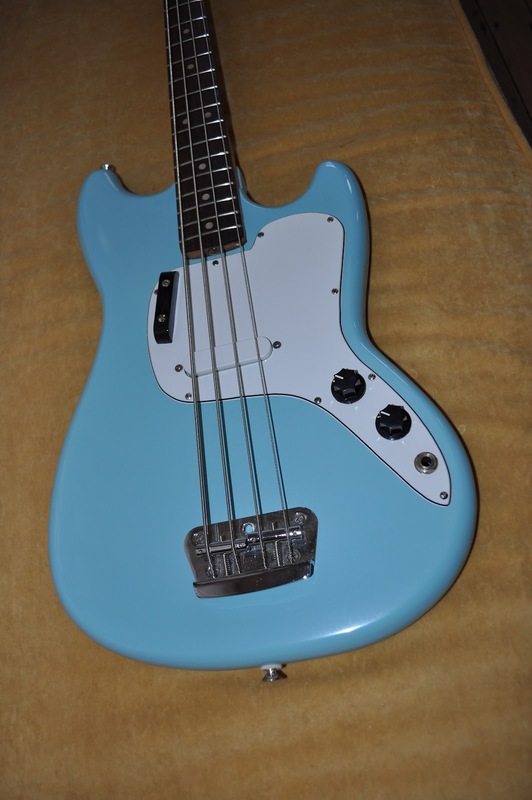 I decided NOT to do a clear coat over the color coat, in keeping with the style of original Musicmaster Bass finishes - though I will point out that Daphne Blue is not a "correct" color for Musicmaster (or Mustang) basses or guitars. This family of instruments had their own formulations of blue and red - with the blue being a slightly darker and greyer variation on Daphne Blue and the red being a slightly darker version of Dakota Red. I believe that at least from 1970 on, these were fairly thin polyurethane finishes as opposed to acrylic and nitro lacquer finishes - so it may be that the red and blue were "offset" colors formulated in a different base. These colors also did not have clear coats applied over them, so they do age slightly differently than typical Fender finishes - with more darkening and less yellowing. I'm not sure what was used to finish 1965 through 1970 Mustangs and Musicmasters - but my 1966 Mustang Bass does not appear to have a topcoat on it and the color is a bit different from Dakota Red. If anybody has some details on this, please let me know or post a comment ! The neck was a straight-forward refret, using Fender's current "medium" guitar fretwire as opposed to the "jumbo" fretwire used on Fender's full-size basses from 1966 on. I made the pickguard using an old hacked up Musicmaster Bass pickguard as a pattern, though I later realized I could have bought one from WD Music Products pretty cheaply. Those are Strat knobs on the controls in this picture - I replaced them with the proper Jazz Bass style knobs. The bridge is a recent Bronco Bass bridge, as is the pickup - with rest of the parts (neckplate, knobs, strap-buttons) being standard reissue hardware. The pickup is a bit different from the original pickup in that it has a bar magnet across the bottom of the pole-pieces (as is typical of many Fender Squier pickups) as opposed to just having magnetic polepieces. I may swap out the pickup for a reissue vintage Strat or Mustang pickup eventually, as these are much closer to the Mustang/Musicmaster guitar pickups that were used in original Musicmaster basses (yes - there are 6 polepieces under the plastic cover for ALL those Musicmaster basses!). The bass has round-wound strings on it, but those may also be switched to flatwounds - as I find that combination to sound particularly good on Musicmaster basses! I do greatly prefer the slimmer 1976 and earlier Musicmaster Bass necks to the much chunkier 1977 to 1982 necks. The more recent Squier Musicmaster and Bronco necks are also of the later chunky shape unfortunately. And here it is - complete !! All in all - a good playing lightweight little bass !! I noticed that you put the tug bar on the bass side when for 1971 it should've been put on the treble side of the strings. No big deal as it is probably more functional on the bass side.